The vehicle history reporting industry used to be dominated by Carfax. However, in recent years, due to lawsuits and a rise in the price of reports, many consumers and dealers alike have begun searching for viable alternatives to the industry giant. AutoCheck is owned by Experian Automotive, and offers one of the biggest sources of competition to Carfax. 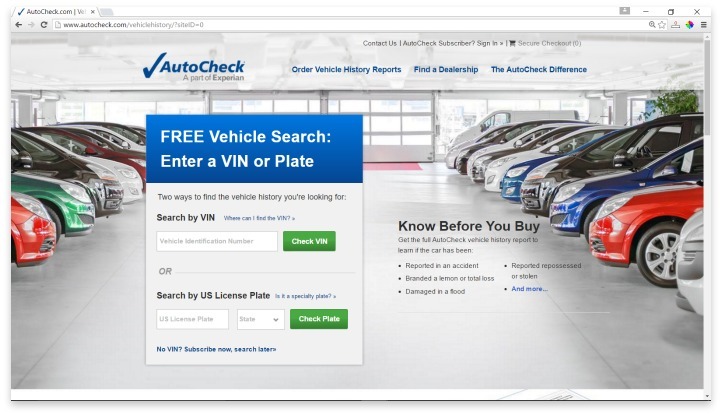 In fact, even trusted used vehicle data source, Kelley Blue Book, uses AutoCheck to power their vehicle history report function on their website. When reviewing AutoCheck, many consumers compare the service to Carfax; AutoCheck promotes this comparison by branding themselves the “affordable alternative to Carfax”. However, the service in itself merits plenty of inspection without the comparison. AutoCheck offers a long list of information on each vehicle, including things like information on title history, registration, usage history, reported damage, odometer readings, rental history, theft records, lien information, accident reports, and gray market values. The service also provides a prediction of how much longer the car will be in great shape, and what the odds are that the car will still be driving in five years. Their information comes from hundreds of data sources; that’s nowhere near Carfax’s reported 91,000, but it’s a good start considering that AutoCheck uses only the most trusted sources to compile data. It comes from state departments of motor vehicles, Canadian motor vehicle departments, auto dealers, consumer protection agencies, and various other government or service and repair sources. Additionally, all of the data that AutoCheck acquires meets both industry guidelines and the Drivers Privacy Protection Act. AutoCheck is more affordable than Carfax and other vehicle history reporting options. While Carfax charges $35 for a single report, AutoCheck charges $25, and has several bundling options for those who are shopping and want to compare more cars at once, or for dealers. And one major plus for many consumers is that AutoCheck doesn’t do automatic renewing payments. You’ll have to purchase a new subscription after the first runs out in order to keep using AutoCheck. You also don’t have to have a VIN number ready right away when you purchase a report. You can buy one or a few ahead of leaving for the car dealership, and then compare while you’re shopping. For most consumers, AutoCheck actually offers a more detailed accident history report than Carfax. Because AutoCheck works more closely with auction sources for data, they frequently get more information about frame damage and unreported accidents than Carfax can. However, Autofax doesn’t always show dealership maintenance the way that Carfax does. AutoCheck offers information on each vehicle, including things like information on title history, registration, usage history, reported damage, odometer readings, rental history, theft records, lien information, accident reports, and gray market values. If recent Carfax changes have left a sour taste in your mouth, AutoCheck is a great alternative. Their information is as accurate as any vehicle history reporting service can offer, and they hit all the main points of car ownership to help consumers make the best decision. Saving the extra $10 from switching from Carfax may not seem like much; but when you are comparing multiple cars throughout a few weeks or months while you hunt for the perfect ride, that savings can add up quickly. Accident history and title information being the two most requested bits of information, there’s really no reason why anyone shouldn’t choose AutoCheck instead and save themselves the $10. Have you had an experience with this company? Please share your AutoCheck reviews below.